We are thrilled to feature new voices and new perspectives, many from women who are posting for the first time in English. Their voices have been missing from the conversation about gender and Mormonism, and their posts highlight the diverse experiences of LDS women throughout the global church. I’ve traveled and moved around the world quite a bit, both by myself and now that I have a family, and I’ll admit that I do appreciate the general “sameness” of Church meetings. It’s nice for my children (and for me!) to know that no matter how different the country where we live may be, when we go to Church it will feel familiar. But I also deeply relish the little differences. For example, in Italy when I arrived at Church I was greeted not with a handshake, but with kisses on both cheeks (and sometimes the top of my head too). There is nothing like being kissed thirty times in a row as you walk in the door to really make you feel welcome. Among my favorite things about attending church in a foreign place is meeting new and different people with whom I nevertheless share many things in common. Church members are always some of my first friends in a new place. And you don’t always meet the people you would expect. Our branch in northern Italy naturally had some Italians in it. But many of the members there were from Argentina, so while Italian was the official language spoken from the pulpit, there was a lot of Spanish floating around in the halls, and I wasn’t the only one with a Spanish accent mixed in with my halting Italian. We also had some members from Nigeria, with whom I conversed in mutually broken Italian for several weeks. Finally one day we laughed in embarrassment and relief when we experienced the sudden simultaneous epiphany that we were attempting to speak a foreign language with a native English speaker. 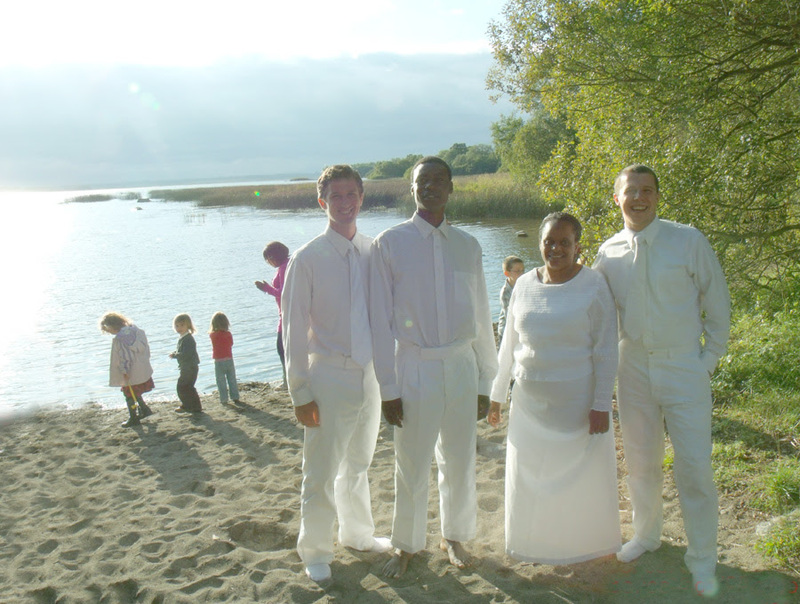 My husband Tony getting ready to baptize a new member in Mullingar, Ireland. Our branch in Florence may have been even more eclectic, although it varied a lot from week to week, since many worshipers were tourists just passing through. One sweet woman in the branch really took us under her wing, although we were only there for a couple of months. She was from Peru, and had lovely thick black hair and a dark complexion. Her husband could not have looked more different. He was from somewhere in Eastern Europe, and his ruddy face was crowned with a profusion of curly blond hair. I loved the fact that they had both come so far from their native lands only to meet each other in this Italian melting pot and fall in love. Aside from the obvious surface differences, another fun aspect of Church in different places is the subject matter of Sunday School discussions. General topics like faith, following Jesus, and loving our neighbor, come up everywhere, of course. Lessons on the Word of Wisdom back home typically tend to revolve around alcohol, smoking, or coffee. In our Filipino Sunday School class, however, we skipped discussing forbidden stimulants in favor of a heated debate on whether we should ever be eating meat at all, since in the Philippines it is never cold, and winter is just a distant fantasy that nobody has ever experienced. In fact, Filipino Sunday School was always interesting, because they have a lovely cultural tradition of respect towards the elderly. Invariably, at some point in the lesson there would be a venerable old man (a little hard of hearing) with bizarre ideas on every subject, who would lecture until it was time for the closing prayer while the rest of the room sat in reverent silence. The ward we attended in Manila was a downtown one with many English speaking foreigners, and meetings were generally conducted in English. Somehow, though, whenever the speakers in Sacrament meeting told a joke, they invariably thought the punch-line would be funnier in Tagalog. So I’d laugh along with the rest and then discreetly lean over to ask my husband what I was laughing about. Some of my most spiritual church meetings have been the simplest ones. There’s something about missing all the usual trappings of church that shows you the importance of what’s left without them. One of my favorite Sacrament Meetings ever happened when I was on a semester abroad in Syria. There were of course no local congregations, and our group of BYU students was on a long bus trip that Sunday, so we had Sacrament Meeting right there in the bus. I watched my friend and classmate Kyler walk down the aisle, swaying a little with the movement of the vehicle on the bumpy road. His hands were carefully cupped together around a little pile of broken bread, which he offered reverently to each of us in turn. Something about the expectant silence of the usually rowdy bus and the intimacy and humility of the bread coming straight from his hands to ours, touched me with strange profundity. It was as if we had turned the mundane world inside out for a moment and made it suddenly holy. The very incongruity of participating in the familiar ritual in such an unexpected place shocked me into really seeing it, as if for the very first time. I pictured the last supper, and Christ’s hands holding out the bread to each of his disciples in turn. It was a visual reminder of how personal his act of offering the Atonement is to each of us, and I’ve never forgotten it. A few years ago, I lived with my husband and kids in another country without the benefit of organized church presence: Tunisia. Just like in most Muslim countries, we were cautioned by Church Headquarters not to be too open about our church membership or meetings. We felt wonderfully blessed to find that there were a couple of other Mormon families in the country too. Every Sunday we took a taxi, then an hour-long bumpy, smelly, death-defying public minivan, and then another taxi to meet in the home of a member for a very simple church service. We would sing a hymn, watch a Conference talk, partake of the Sacrament from the smallest cups in our host’s cupboard, and then sit around in a circle for a Sunday school discussion while one adult rotated out to teach our tiny, five-child Primary. 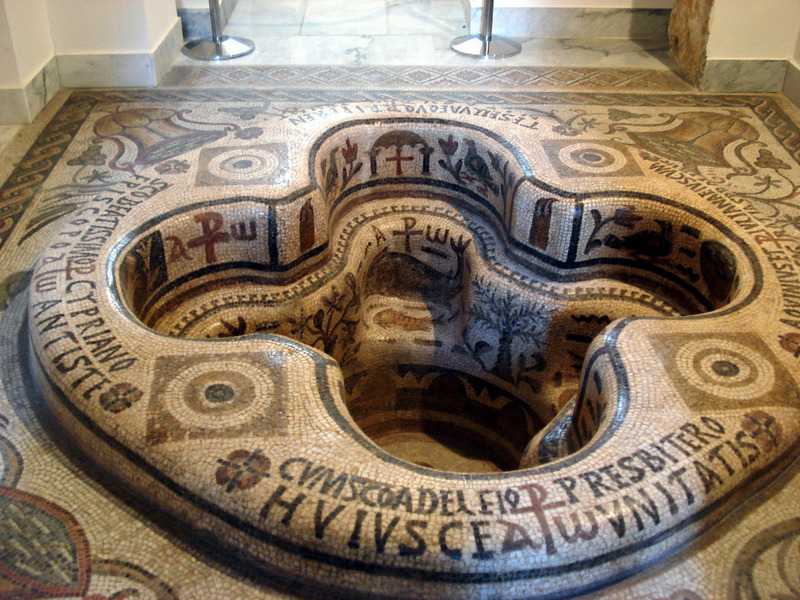 An early Christian baptismal font in Tunis, Tunisia. Our meetings were held in Carthage, a well-heeled Tunis suburb built right on top of the ancient Carthaginian capital and its Roman successor. When we visited the nearby mosaic museum, we found this beautiful sixth century tiled baptismal font designed for immersion baptisms. St. Augustine lived and taught in Carthage, and many early Christians met martyr ends in the ruined Roman amphitheater just down the street from where we met for church. My favorite weeks there were our testimony meetings, where it was not a question of if you would bear your testimony, but when. Gathered together as a tiny band of believers in a country full of chaos and unrest, we poured out our hearts to one another and were spiritually strengthened. In those moments, I felt a powerful kinship with the ragged, persecuted members of the early Christian Church, who must have also met secretly in private houses on those same Carthage streets, shared the Lord’s supper, and borne testimony to one another. My parents used to tell me, “learn a new language, gain a new soul.” Traveling far from home has a way of opening your mind and heart, and making you realize that the things you took for granted as obvious, necessary, and right might look a little different from a different point of view. I remember my dad speaking with regret of telling the members on his mission in rural Guatemala that the guitars they traditionally used to accompany their religious music were inappropriate for L.D.S. services. As a 20-year-old missionary, he thought he was doing the right thing. Two decades later, he had come to the conclusion that forbidding them from using the only type of musical accompaniment they had was far more inappropriate than accompanying hymns on a guitar in Sacrament meeting. As I have visited Church services that were different from the ones I grew up with, I’ve realized more and more that diversity isn’t a bug in the system–it’s a feature. When we encounter a different way of thinking, or a different way of doing things, we’re forced to reexamine our assumptions for how things should be done. For example, I’ve seen parenting done all different ways in different countries. 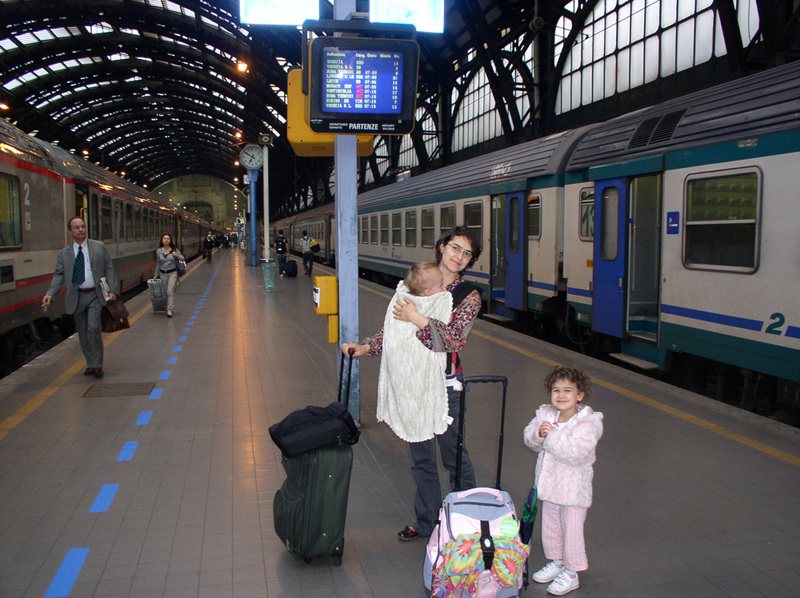 Parents in Italy routinely let their kids stay up till 11 at night. Tunisians let their six-year-old run to the store to buy bread alone. The accepted “perfect” first food for a baby varies depending on his or her parents’ nationality. And yet, I’ve managed to meet happy, healthy, well-adjusted kids all over the world. And seeing different ways of parenting has helped me to revise some of my ideas about how to parent my own children. Thank you for sharing this! What a fun adventure that to experience life and church in soany different places. I agree that the tiny differences are the things that make the congregation and meetings into something memorable, no matter how big or small the ward or branch. Thank you for sharing here! No maybe about it! My absolute favorite thing to do when I travel is to go to church locally. Seeing the sameness AND the differences of the church worldwide helps me know the church is true and the gospel comes from heaven. I do like seeing members do things differently in different places, it makes me think “why didn’t we think of that” or perhaps more accurately “why would you get criticized or goggled at if you tried it in America?” One of my favorites was a branch in France. A few families had infants, and rather than bounce them and hold them until your arms fell asleep, they just had the stroller right there (their baby strollers looked more like prams and less like the sit-up ones common in the US) and so parents laid their parents down and rolled the stroller back and forth until the baby fell asleep for the meeting. It made so much sense! I also saw them feeding something much closer to a real meal — yogurt and so forth. It also made sense, since I knew a lot of members had to come from far away, and the kids would never make it home for lunch. Considering our ward always meets from 11-2, tired hungry and crabby tends to be the prevailing mood (including in adults). I remember also being surprised (though I shouldn’t have been) by the bise — the kisses on the cheeks. Somehow it felt really intimate and therefore shocking to me, and yet also I felt loved and welcomed that they knew me enough after only a few weeks in the branch to see me as a friend. I suppose hugs probably seem very intimate in cultures where they aren’t a casual greeting between friends. *parents laid their kids down. Silly. The kisses are seriously my favorite, although my enthusiasm has been somewhat dampened at times when it’s the middle of winter and dozens of people are kissing my kids and passing around who knows how many germs. The funny thing about kissing as a cultural greeting is that it’s different everywhere. In Syria, it was only observed between people of the same gender, and it always involved multiples of three (on alternating cheeks). So three kisses as a normal greeting, six if it had been awhile since you’d seen the person, nine if you were really excited to see them, etc. In Italy, it was only two, and it’s really embarrassing if you go in for that extra kiss. Or if you try to start on the wrong cheek (and I can never remember in the moment which cheek is the right cheek for which culture). You can even end up with an actual, full-blown kiss on the lips if the two of you simultaneously go in for opposite cheeks. My Argentine mission companion told me how infuriating it was for her in high school when the boys would pretend they were just greeting her normally, and then turn their heads at the last minute to steal a kiss. All in all, there’s incredible potential for awkwardness. But still, it’s a lovely tradition. That scripture in Ephesians is one of my favorites! Figures it would be one of yours, too. Thanks, Sarah. This is great. And I love that scripture too. I cherish my memories of holding meetings with our little group of expat members in Duri, Indonesia; meeting in an Indonesian member’s modest home in Sumatra; and then a more traditional branch meeting with a larger group of Javanese with most of the meeting spoken in their language. All were different, all were simply wonderful and inspiring. Thanks for sharing your experiences. Tony still speaks fondly of those church meetings in Indonesia too. Heard Elder Neil Anderson speak at our stake conference tonight. He mentioned how difficult it is for the Twelve to speak of issues that are of local cultural importance and how much more important it is to speak instead of doctrinal issues. He related a story of he and a member of the 70 in Peru. The 70 pointed out a native missionary with a long braided hair and worried about its image. Elder Anderson told him there was no problem, that the missionary’s hair was proper grooming for one from his indian heritage. He related how the church is growing fastest in Africa and that the Wasatch Front culture has little bearing and relevance to these cultures. This is such a hopeful thing to hear! I’m so glad that you told us about this experience! It’s great that he would share that story. But it’s also somewhat worrying that basic cross-cultural literacy is obviously not making it into whatever training high-ranking church officials get, and needs to be imparted on an ad hoc basis like that. Sarah, I think you’ve hit the nail on the head here in so many ways. 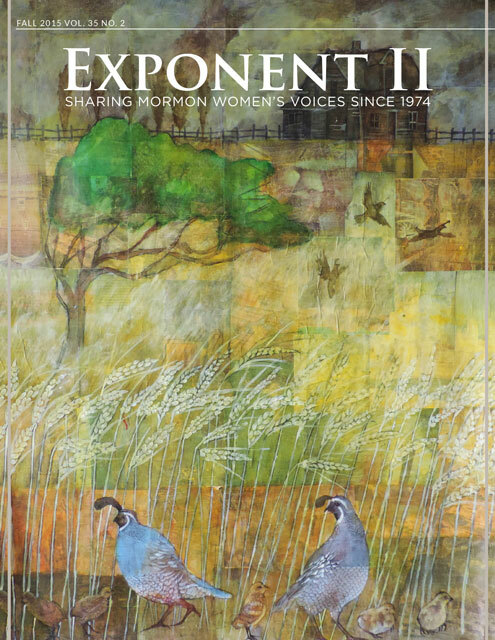 So many people in this series have talked about our their mindsets have shifted from being the minority – I agree that the church leaders could learn a little bit from being in that situation as well (and I think that might be why so many “minorities” in the church resonate with Pres. Uchtdorf, whether they’re ethnic, cultural, or philosophical minorities, because he has not been born/raised in the US). Really interesting. Each of these international insight pieces is wonderful. This one is especially wonderful!